The East Sixth business district has grown over the years. It’s still authentically rough around the edges, but new buildings and businesses are popping up all the time. If you’re a self-proclaimed foodie like me, East Sixth Street should be added to your list of areas to explore. It’s quite walkable, and the ever-changing lineup of eateries will keep you busy all year long. For a fun-filled foodie adventure that begins first thing in the morning and lasts all day long, follow this itinerary of seven East Sixth Street restaurants and cafes. If breakfast isn’t your thing, but you need a morning caffeine fix, make this your first stop. Cuvee Coffee Bar has a small menu, but their coffee packs a bold punch. The menu holds all the essentials, including espresso, drip coffee, cold brew, and assorted teas. The bar also carries breakfast tacos and pastries for a light bite. 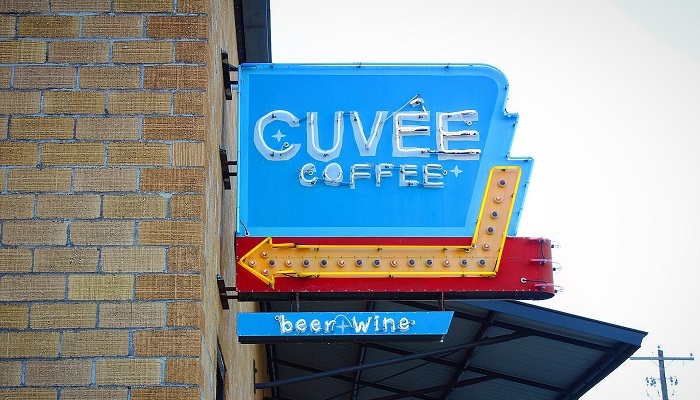 If you’re the more curious type, stay for one of Cuvee’s guided coffee tastings. For those with a more ferocious appetite in the morning, head next door to this local favorite. 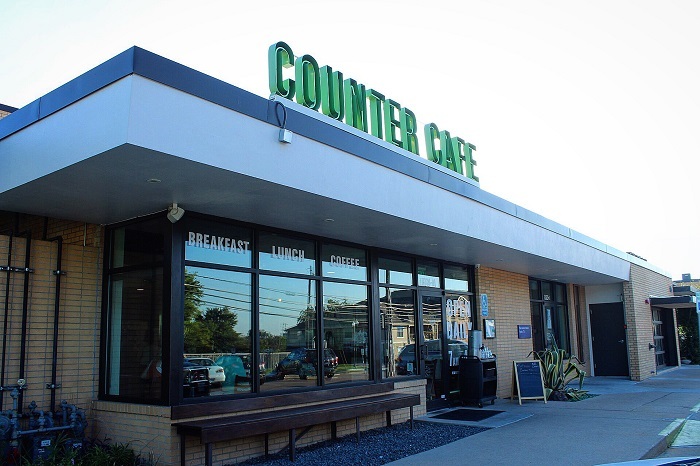 Counter Café East is the sister counterpart to its much smaller original location on North Lamar. Breakfast is served all day, so don’t worry if you aren’t an early riser. Counter Café serves everything from fruit and granola to crab cake benedict. More importantly, it has bottomless, local coffee. While this location is much larger than the one on Lamar, it does get busy at times. Prepare accordingly. Don’t forget to stop back for lunch–Counter Café has a highly-rated burger that’s sure to please. 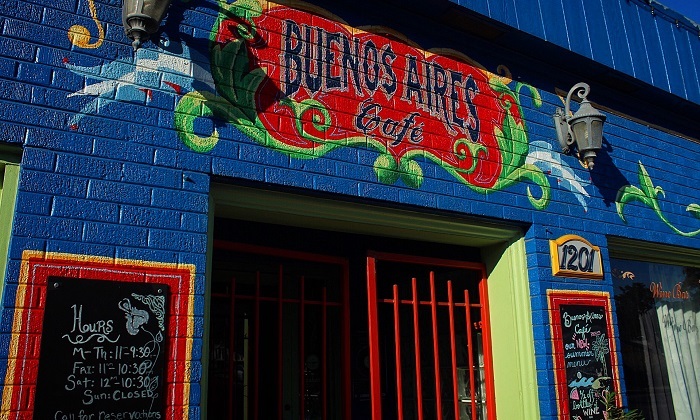 You can easily spot this brightly painted Argentine café on the corner of Sixth and Waller. Buenos Aires Café opens at 11 a.m., so it’s a perfect stop for lunch. The empanadas are a must-try, and don’t forget to order a side of chimichurri to slather on everything. The menu also includes soups, salads, sandwiches, and grilled entrees. Insider tip: there’s a romantic speakeasy in the basement for late night relaxation. Text 512-593-1920 with your full name, number in party, date, and time you wish to attend. Your passwords and entry details will be provided with your confirmation. 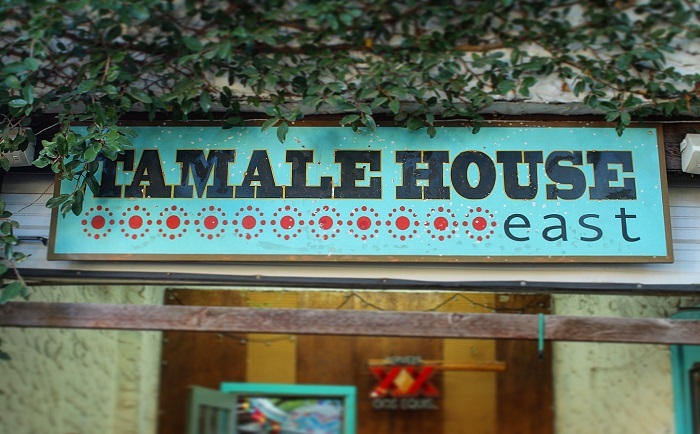 Although the address is on Sixth Street, the main entrance to Tamale House East is actually on Fifth. This restaurant is a local standard for all your favorite Tex-Mex cravings. The menu covers it all: tacos, enchiladas, and signature tamales. This spot is vegetarian- and vegan-friendly. Be sure to try the cochinita pibil: pulled pork that is cooked for 16 hours with cinnamon, orange, and 16 other spices. Your taste buds will thank you. Tamale House East also has one of the prettiest garden patios in all of Austin. It’s a must-see! Licha’s Cantina has some of the tastiest Mexican food I’ve ever had. It also has one of the best happy hours in the city, with everything on the menu at $5, with portions sizable enough to share. 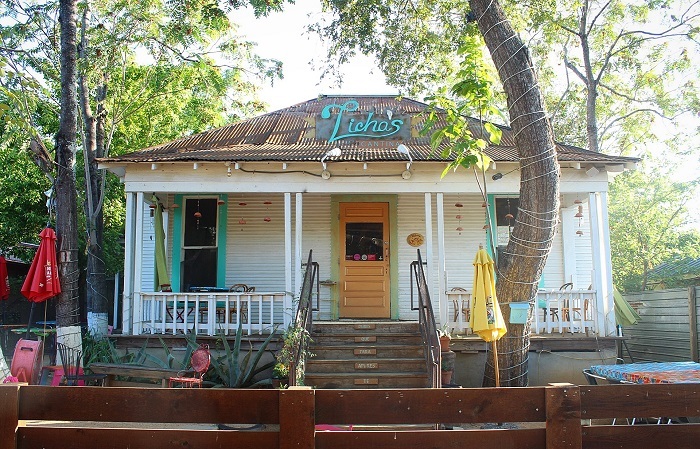 Licha’s can almost be hard to spot, since the old house it operates out of is set back off Sixth Street. But don’t let the exterior fool you. The team cooks up some really tasty fare. Enjoy dinner and drinks outside in the front courtyard, or inside the dimly lit restaurant. Some highlights are the hibiscus quesadillas, any of the sopecitos, and the soup of the day, which is typically a scratch-made pozole. Ah Sing Den is open until 2 a.m.
Have you ever wondered what the inside of an opium den might look like? Look no further than Ah Sing Den. The dim lighting, comfortable booths, and 1920’s décor transports you to another world. The venue is open until 2 a.m., so check it out if you’re looking for a night cap or late night snack. The Asian-inspired menu showcases rich flavors including wild-caught Texas boar ribs with Filipino BBQ sauce, plenty of curry, and miso-udon bowls. 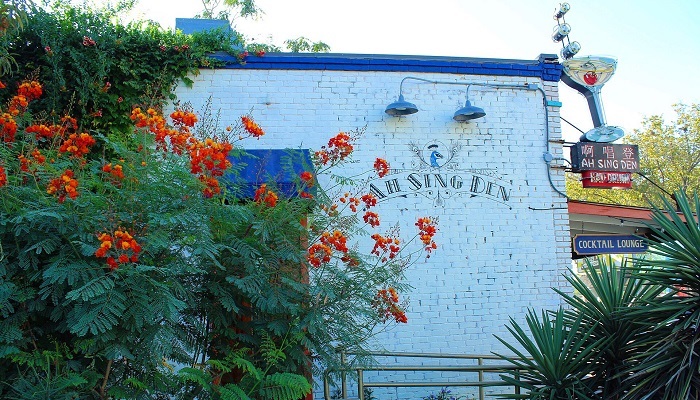 Ah Sing Den offers happy hour daily from 5-7 p.m. On Motown Monday, happy hour goes all night. Watering hole, late night eats provided by Baton Creole, live music, a juke box, and a spacious outdoor patio. 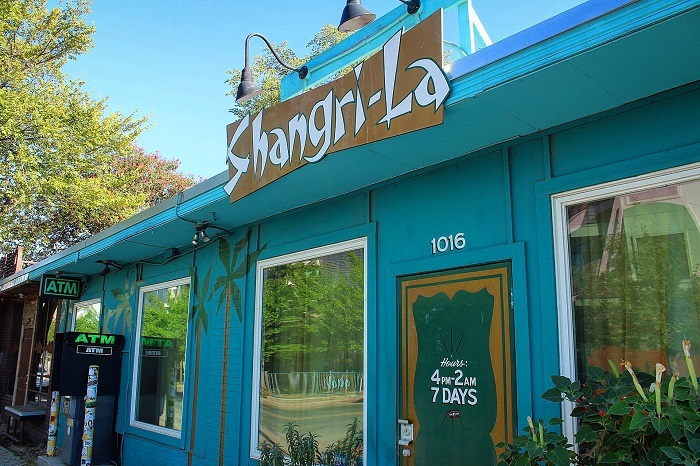 Shangri-La has it all. There’s trivia every Monday night, and Cards Against Humanity is a regular bar game. Check out Baton Creole’s late night grub, including the signature jambalaya, gumbo, and beignets. Shangri-la has an array of cocktails on the menu, as well. 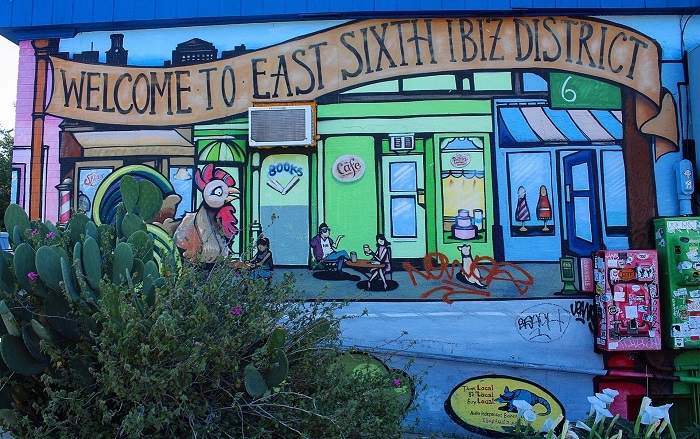 What are your favorite East Sixth Street restaurants, cafes, and bars? Amanda Gagnon is always in search of the tastiest local food finds, exploring all that Austin has to offer. Follow her on Instagram to check out her Austin adventures.